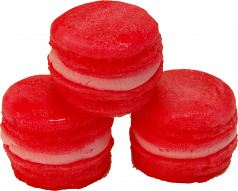 Home :: Artificial Desserts :: Fake Macaroon :: Pink Strawberry Fake Macarons (Macaroon) with Cream 3 Pack U.S.A. Pink Strawberry Fake Macaroon with Cream Fake Dessert. Using our Artificial Products to achieve the most realistic fake Macaroon with cream center.